Ferdinand Porsche was born in the North Bohemian town of Maffersdorf, now the Czech district of Vratislavice. Six years ago, the carmaker Škoda bought the childhood home of the automotive pioneer. “This place is truly unique,” enthuses Andrea Frydlová. “It offers a glimpse into not only the life and significance of Ferdinand Porsche but also the innovative drive of this region at the end of the nineteenth century.” The “unique place” is Tanvaldská 38 in Vratislavice nad Nisou. This address was on the main street of Maffersdorf 142 years ago. The grounds included the family residence and attached workshop of the tinsmith Anton Porsche and his wife Anna. It was here, on September 3, 1875, that the third of their five children—Ferdinand—was born. Today, the estate looks almost exactly like it did back then: a proper picket fence, a cobblestone courtyard, a well-tended yard, and the home and workshop at the heart of the grounds. “The reconstruction and renovation of the estate was complex and time-consuming—and a great success,” says Frydlová. The art historian is both the director of the Škoda Museum in Mladá Boleslav (around fifty kilometers away) and the lady of the house, so to speak, at the birthplace of Ferdinand Porsche, now open to the public. The estate was bought by Czech carmaker Škoda in 2011 and later converted to its present form. The Porsche birthplace and the Škoda Museum are now a formidable tradition-preserving duo in North Bohemia. A combination ticket offers admission to both exhibitions. “The exhibition at the house where Ferdinand Porsche was born is structured into three themes: engineering spirit, mobility, and family,” explains Frydlová. It establishes a relationship to the region, which at the end of the nineteenth century was a center of industrialization and thus the ideal environment for a curious young man with a penchant for experimentation like Ferdinand Porsche. It also highlights how the designs and inventions of Porsche still shape the automotive world today. Upon entering the museum, visitors receive an iPad on which they can delve into details according to their interests. Each exhibit is given a small symbol that can be scanned with the tablet to unlock a plethora of additional information, photos, and videos, allowing the user to decide how deeply they would like to examine the particular theme. With a few swipes of the finger, the visitor is suddenly right in the midst of the Sturm und Drang phase of the young Ferdinand Porsche, whose head was full of ideas quite distinct from what his father had in mind for him. Originally, his elder brother Anton Porsche was supposed to take over the tinsmithy, but he died in a workshop accident in 1888. Hence, Ferdinand Porsche took the role of his father’s successor as head of the company. After eight years of schooling, he began a tinsmith apprenticeship in his father’s operation. The fourteen-year-old, however, was much more interested in electricity than pipes and threads. As often as he could, he would visit the Ginzkey spinning mill a few streets away. At the time, Ginzkey was the largest company in Maffersdorf and known well beyond the borders of Bohemia. The plant housed some 250 perpetually chattering mechanical looms that produced mainly blankets and rugs. Years later, in the 1920s, what was then the largest rug in the world was made there for the Waldorf Astoria hotel in New York. The state-of-the-art electrical system in the factory so fascinated Ferdinand Porsche that he secretly began to experiment with electricity in the attic of the family home. Among other things, he outfitted his ice skates with battery-powered lights, which caused a considerable stir on the frozen village pond. Alas, his father Anton had little patience for his son’s innovative drive and forbade him to tinker with electricity. His mother Anna Porsche saw things differently. She understood her son’s thirst for knowledge and persuaded her husband to at least allow their son to attend evening courses in electrical engineering at K.u.K. Staatsgewerbeschule, the state-run trade school, in nearby Reichenberg (now Liberec). Ferdinand Porsche took advantage of the opportunity, and soon even his father regarded his son with great pride. In 1893 Ferdinand Porsche outfitted his family home with electric lighting and an electric doorbell, making it the second building in Maffersdorf, after the Ginzkey factory, to have these features. That same year, Ferdinand Porsche left Maffersdorf for Vienna. The family business was later taken over by his younger brother Oskar. Ferdinand Porsche, for his part, combined his knowledge of electrical engineering with the then quite new invention of the automobile. The result was a vehicle with wheel hub motors, the first hybrid vehicle, and the world’s first all-wheel-drive vehicle. In 1902 Ferdinand Porsche headed back to his hometown in the Lohner-Porsche Mixte hybrid model. Although he most certainly intended to show off the car, he mainly wanted to introduce his parents to his future bride, Aloisia Johanna Kaes. A photo in the exhibition documents the visit. Forming the centerpiece of the exhibition is a replica of the first hybrid car designed by Porsche, the Lohner-Porsche Semper Vivus, which is Latin for “always living.” Developed in 1900, the vehicle featured two-wheel hub motors and two one-cylinder combustion engines, with the latter powering a generator that continuously recharged the batteries while driving—hence the name. It performed extremely well so that the range of the world’s first functioning hybrid automobile was an astonishing two hundred kilometers. The car was a milestone in automotive history—andyet only the beginning of Ferdinand Porsche’s lifetime of invention. This alone is a testament to the extraordinary innovative talent and drive residing in the tinsmith’s son from Maffersdorf. There is certainly no better place to display this car than at the birthplace of its inventor. A man whose ideas and technical solutions embody the same spirit as his hybrid prototype: semper vivus. In 1893, at the age of eighteen, Ferdinand Porsche leaves his childhood home in Maffersdorf and heads to Vienna, where he takes up a position as a technician with Vereinigte Elektrizitäts-AG. There he develops the famous wheel hub electric motor. 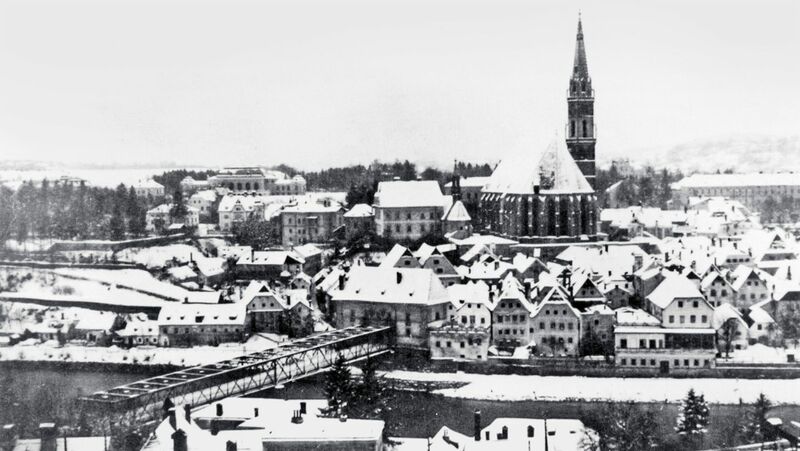 In 1899 Porsche moves to Lohner-Werke, Austria’s largest coachbuilding factory at the time. There he builds the world’s first functional hybrid and the first all-wheel-drive vehicles. In 1906 Porsche leaves Lohner to join Austro-Daimler in Wiener Neustadt as head designer. In 1923 Ferdinand Porsche builds this villa in country-manor style at Feuerbacher Weg 48 based on plans by Stuttgart architects Paul Bonatz and Friedrich Eugen Scholer. Porsche has just become a member of the board at Daimler. In 1934 a wing encompassing garages and a workshop is added to the villa. In 1935 this is where the first two prototypes of the “KdF car” come into being, which after World War II will power mass mobility as the Volkswagen Beetle. Today, the villa is used as a guest house by the Porsche family. After Ferdinand Porsche’s board contract at Daimler in Stuttgart is not extended in 1928, he moves to Steyr-Werke in Upper Austria as technical director in early 1929. There, among other creations, he designs the Steyr Austria with an eight-cylinder engine and 75 kW (100 hp). When Steyr begins to work closely with Austro-Daimler, increasingly restricting Porsche’s creative freedom, he leaves the company in 1930. The liaison ultimately leads to the formation of Steyr-Daimler-Puch AG in 1934. On April 25, 1931, Ferdinand Porsche forms the company Dr. Ing. h. c. F. Porsche GmBH, Konstruktion und Beratung für Motoren- und Fahrzeugbau, headquartered at Kronenstraße 24 in Stuttgart. Not far from the central station, the company initially employs twenty staff, including son Ferry Porsche. 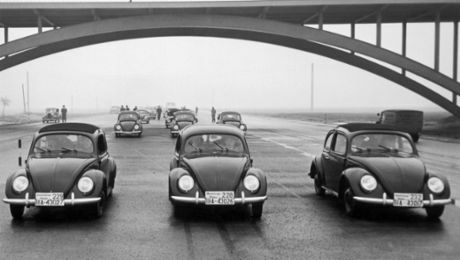 While at Kronenstraße, the company develops the plans for the Zündapp and NSU automobiles, the Auto-Union sixteen-cylinder race car, and the Volkswagen—better known as the Beetle. The building still stands today. Located in an Alpine pasture above the town of Zell am See, this six-hundred-year-old estate catches the eye of Ferry Porsche while on a drive in the 1930s. Ferdinand Porsche buys the estate in 1941. The family initially uses the estate as a vacation home and later as a refuge from the turmoil of World War II. The chapel next to the large farmhouse houses the family burial grounds. To this day, the Schüttgut estate is a working farm with 140 cattle. It now belongs to Dr. Wolfgang Porsche. After the Allied bombing raids of Stuttgart in late 1944, Ferdinand Porsche moves his company to a former sawmill in the town of Gmünd in the region of Carinthia. Until the end of the war, the Porsche engineering office works on military projects. From 1946 it’s the production site of light tractors, winches, and hydraulic turbines. In 1948 Ferry Porsche realizes his vision of the perfect sports car—the Porsche 356. The company’s first two-seater receives chassis number 356-001. Friday to Sunday 9:00 a.m. to 5:00 p.m.